For decades the main party of the Greek working class was the PASOK, founded in 1974 immediately after the fall of the military junta. It won 13.5% in the first elections it stood in that year, seven years later going on to win a landslide victory with 48% of the vote and forming the first left government in Greece’s history. The rise of PASOK between 1974 and 1981 was a clear expression of a radicalisation to the left of Greek society. This radicalisation to the left was based on the revolutionary ferment that began with the student movement and the events at the Polytechnic in Athens in November 1973, the collapse of the Junta in July 1974 after the big national crisis provoked by the failed adventurist coup d’état that the Greek colonels organised in Cyprus, together with the sudden sharp slowdown in the economy and the very radical left rhetoric of Andreas Papandreou, the founder of the party, and the general outburst of class struggle. This opened up a prolong period of radicalisation until the election of the first PASOK government in 1981. It seemed to the masses that Andreas Papandreou was proposing a radical socialist transformation of Greece. He was, what in Marxist terms is defined as a “centrist”, i.e. he vacillated, in words at least, between Marxism and Reformism, reflecting the opposite pressures of two classes, the working class and the bourgeoisie. Once in government, however, the party entered a long process of social-democratisation, with an abandonment of its previous rhetoric. Kostas Simitis, leader of the party between 1996 and 2004, was seen as the Greek Tony Blair, and in effect expressed the same political current, a bourgeois tendency that was using the main party of the working class to push through the agenda of the bourgeoisie. The PASOK was able to stabilise itself as one of the main political forces in Greece thanks to its strong base within the working class which had sought in it a party to defend its aspirations to greater social justice and better living and working conditions. As it shifted to the right – losing in the process much of its active base – itwas able to hold on to its electoral base due to the relative stability in the economic situation, especially with the return to significant growth post-1994. In these conditions, the PASOK won three consecutive elections in 1993, 1996 and 2000 (with 47%, 41.5% and 44% respectively). However, its policies in government eventually prepared a shift to the right and the victory of New Democracy in 2004. The end of the boom period and the onset of crisis of 2007-08, however, catapulted the PASOK back into government in 2009 with 44% in the elections of that year. Within two years of being in office and carrying out draconian austerity measures imposed on Greece by the Troika [European Commission, the European Central Bank and the International Monetary Fund], opinion polls started showing a sharp decline in support for the PASOK, with large numbers of its voters feeling very disappointed. In the 2012 elections its vote massively collapsed, falling to just over 13%. In the four elections of May 2012, June 2012, January 2015 and September 2015, its vote went down to 13.8%, 12%, 4.7% and 6.2%. Meanwhile, to its left we saw the emergence of SYRIZA, which expressed the radicalisation of the Greek workers and youth. SYRIZA is now a party, but previously it had been a coalition of left forces, the main component of which was Synaspismos. Back in 1993, when the PASOK was still riding high, Synaspismos failed to even reach the 3% threshold to get into parliament. But the following year in the European elections the party won its highest score ever (before the recent surge), winning 6.26% and then in the 1996 parliamentary elections it went on to win 5.12% in national parliamentary elections. Its vote fluctuated between 4% and 6% throughout this period. In 2001 there was a first attempt to build a coalition of the left, but it was in 2004 that SYRIZA emerged as an alliance of left forces, with its main component being Synaspismos, which won 3.3% and six MPs, in 2007 doing a little better with 5%, and in 2009 with 4.6% it won 13 MPs, among them Tsipras, who became leader of the parliamentary group. No one then imagined that SYRIZA would go on to play the role that we subsequently saw. Things were so bad that in 2010 the right wing of Synaspismos broke away to form the Democratic Left (DIMAR). This group aspired to “greater things”, i.e. to government positions, and were looking to make a deal with the PASOK. Little did they know what was about to happen! In December 2008 the killing of a young school student, Alexandros Grigoropoulos at the hands of a police officer, unleashed a massive student protest. That movement – as we explained in Revolutionary ferment in Greece – a taste of what is to come for the whole of Europe – marked a significant turning point in the situation. It highlighted the growing youth radicalisation that was taking place, a harbinger of greater things to come within the working class as a whole. At one point in 2008 SYRIZA was at 18% in the opinion polls. This was cut acrosswhen its leaders came out saying they would be prepared to form a coalition government with the PASOK, and it fell back to 12%. No such coalition ever materialised, as the PASOK vote eventually collapsed and a mass of PASOK voters began shifting to SYRIZA. This future shift of the electorate could already be detected prior to the big electoral surges of SYRIZA. When it was still at 4-5% in the wider electorate, opinion polls began indicating that among the youth support for SYRIZA was around 18-20%. As is often the case, the youth are like a barometer indicating future changes in the political climate. The youth movement of 2008, and the political radicalisation that went with it, was an anticipation of what was to come about, a political earthquake that would shake Greece to its foundations. The first shock came in the May 2012 parliamentary elections, where SYRIZA won 16% of the vote, quadrupling its number of MPs, and this was followed in June in the second election when the party shot up to just under 27%, only a couple of percentage points behind New Democracy. 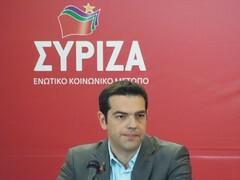 SYRIZA won even higher levels of support among workers of both the private and public sectors and the unemployed. Among the youth the shift was even bigger. This was the first time that a party which had roots in the Communist tradition had overtaken a social democratic party since the fall of the Berlin Wall. But whereas the rise of the PASOK came in a period which allowed it to stabilise and become a major force in Greek politics for decades, the rise of SYRIZA came at a very different historical period. SYRIZA came to power promising an end to austerity, but once in government it rapidly moved away from the radical language it had adopted prior to the January 2015 election and ended up surrendering to the Troika after the July 2015 referendum. This had an impact on SYRIZA’s electoral support, although if one looks only at the percentage it won, this would not be so apparent. In September 2015 the party managed to win more or less the same percentage (35.46%) as in January (36.34%), but this hid a process that had already begun, continues today and which will eventually materialise as a massive swing away from SYRIZA. Between the January 2015 elections and September it lost less than one percentage point, but this doesn’t give the full picture, as there was a significant increase in the numbers abstaining. In January 6,180,872 turned out to vote, against September’s 5,431,850, a net abstention of around 750,000 voters, 12% of those who had voted only nine months earlier. This reflects the disillusionment that had begun to set in already in September. Most of the youth abstained in the September elections because of disillusionment and confusion within the working class which was mirrored among the students as well. The youth didn’t know who to vote for because none of the parties convinced them. If one takes a closer look, the shift in votes away from SYRIZA was much bigger than seemed the case.The total number of votes the party won in January was close to 2,250,000, but by September this had fallen to around 1,925,000, a net loss of about 325,000 votes. Studies have shown that SYRIZA actually lost 600,000 of the votes they had won in January, i.e. more than one quarter of those who had voted for the party. Before the September elections, SYRIZA also split, (we have covered this in other articles), and the new party that emerged from its left wing, Popular Unity (LAE), won around 150,000 votes, which would mostly have come from SYRIZA. Although SYRIZA lost votes to the left and to abstentions, it also gained 300,000 from other layers who had not voted for them previously. In working class areas SYRIZA lost much more in percentage terms, where many abstained, but they gained some layers in the more middle class areas, as the party was now seen as a “new” but more “responsible” force, a kind of PASOK Mark 2. There were also some interesting studies of the vote broken down by social groups. For instance in January 2015, 45% of the unemployed had voted SYRIZA, but by September only 15% of this layer continued to vote for them, indicating that among the more downtrodden layers the party had nothing left to offer once it had tied itself to the austerity of the Memoranda. The process of disillusionment continued after the September elections and recent polls show a dramatic fall in support for SYRIZA. The big hopes of January 2015 have turned to despair. A poll conducted by the University of Macedonia, and published at the beginning of July, reveals that 28.5% would vote for New Democracy if new elections were called in the coming period, and only 17% would vote for SYRIZA. That means the party would lose more than half the votes it won in September. The same poll revealed that 69% of those who had voted for SYRIZA last time are now dissatisfied with the government. This fall in support for SYRIZA is even sharper among the youth. The voting patterns in the university student elections give us an idea of what is going on among the youth. In each Faculty a council is elected by the students every year. We have to note that there is a very high level of abstention in the se student council elections, with around half the students not voting. The following are the main forces that stood last year (2015) with their overall vote nationally across all universities. DAP, the New Democracy (ND) student front was the biggest in absoluter terms with 23,000 votes. The PKS, the KNE’s student front (KNE are the Young Communists) won 12,000 votes and was the second largest force. EAAK, the Antarsya front (most of the far left groups organised in a united front), won 8,500 votes. Left Unity, the SYRIZA student front, won around 7,500 votes. The PASP, the PASOK’s student front, won 7,000 votes, although in the past it used to be the second biggest student front. This year there was a very sharp fall in support for SYRIZA’s student front. Last year Left Unity won 8%, but this year it was sharply down to only 0.8%! Disillusionment with the SYRIZA government started already last year among the younger layers, an anticipation of what was about to happen among the wider electorate. But this year’s complete collapse in support for SYRIZA among the students is indicative of what is about to hit the party. The percentage breakdown of the student vote this year is revealing. EAAK won 16%, PKS 21% [up from 19% the previous year], Left Unity [SYRIZA] 0.8%, PASP around 7%, and DAP [New Democracy] 36%. What has happened is that within the left vote there has been a radicalisation further to the left. This is shown particularly in the 16% won by EAAK, the Antarsya student front and also in the small increase of the PKS. It is worth noting that the left split from SYRIZA, Popular Unity (LAE) did not stand independently, but participated within EAAK, as it has very small forces among the students. The above figures do not give a precise image of the shifts among the youth, as young workers are not taken into account, but they do give a rough idea of the process. It is clear that among the youth there is a polarisation, as in the rest of Greek society, between left and right, and within this process the combined forces of the left clearly outnumber the right. The problem is that among the mainstream parties there is no force capable of giving expression to this radicalisation. What is evident is that SYRIZA is in serious decline, but to its left no major force is emerging. The KKE, in spite of significant support among the students, remains stuck around the figure of 5%. In fact, in last year’s September elections, in a situation where it should have been growing, it managed to accomplish an actual fall in its electoral support, losing almost 40,000 votes! This is due to its extremely sectarian stance in relation to all other left forces (but that is another story). Popular Unity, LAE, thought that it could increase its fortunes by pushing the slogan of a return to the Drachma, but flopped in the September elections, failing to get into parliament, when it only managed to win 2.7% of the vote, short of the 3% threshold. Since then polls indicate that it has weakened and not strengthened. This reveals that it is not in touch with the real mood on the left. Antarsya has seen a certain growth from its previous more or less 1% to around 2%, but again, this is very little to be able to have a major impact, although there is an important layer that looks to them, given the vacuum on the left. What is certain is that as the material conditions worsen further in the coming period, the youth will be forced to react and we will see new waves of protests. It is among this layer that the ideas of Marxism will find the most favourable response, and at some point will also find a political expression. The deep crisis of Greek capitalism is not going to end soon, but will get worse as the European and world economy enter further into crisis. In these conditions the political volatility we have seen in recent years will continue. We will see sharp turns to the left and to the right. If we look back to the past – outlined above – we can see that without the shock of the 2007-08 economic crisis and the severe austerity this led to, there would not have been the collapse of the PASOK and the meteoric rise of SYRIZA, just as without the revolutionary ferment of the 1970s there would not have been the sudden appearance and meteoric rise of the PASOK. The difference today is that SYRIZA does not have decades of relative economic stability ahead of it. On the contrary, it has a severe crisis to deal with, something it is incapable of handling. That means it is doomed to lose much of the support it gained in recent years. Only when a party emerges that is capable of solving the crisis Greece is mired in, will the fragmentation of the electoral front and the volatility end. The point is that there is no solution on a capitalist basis other than the “internal devaluation” referred to in previous articles, which means vicious attacks on the working class. The real solution is to be found in the ideas of Marxism, that explain that the way out is the revolutionary overthrow of capitalism, the nationalisation of the commanding heights of the economy, and a workers’ government that puts an end to capitalism. That is what the Marxists must patiently explain as they build up their forces.